But Sunday is a relaxing day for everyone, after hectic schedule of the week, one needs to calm down and relax; not think of work. But Sunday gets wasted into thinking about how busy week’s schedule was and how busy it will be, and then catching up with family members. Yes it was a fine Sunday and Small Steps had organised a great water Sports activity in Kolad in Raigad District. ‘Rafting!’ So here we go. A bus was organized from Dadar so that people from in between could be picked up. Sharp at 5.30 am it left from Dadar and arrived in Panvel at 6.20 am. And the Journey began; Kolad is something of 2-hour journey from Panvel. Many people had joined this event of Small Steps; we were around 43 including the organizers. Well what happens on a bus when people are excited about an event; you sing and dance. That’s what exactly happened; Antakshri our favorite game to pass the time. All the songs right from Dilip Kumar’s time to Ranbir Kapoor were sung. What a range! The breakfast was served in bus only. Delicious ‘kande pohe’ and ‘cakes’. Well what else do you need when your tummy is full and you are awaiting for an event. So finally we reached our destination Kolad at around 10 am. Kolad has come up recently with water sports activities and has become quite popular spot for leisure time during weekends. Leaving our bags in bus we headed towards getting prepared for rafting. Forms signed check; life jacket worn check; helmet on check; Peddles geared up; and here we go. Divided into 4 Rafts we received instructions from the Instructors who work there and accompany you for the activity. We were 5 boys and 3 girls and one instructor in our raft. So our instructor gave us the instructions; taught us about the signals/commands and gave us a little practice session before starting. Finally into the rapid waves, the adventure we all were waiting for started. Going with the flow in the river Commands like Forward to peddle the raft ahead, Backward to peddle the raft back, stop to stop peddling duck to protect ourselves and duck into the raft where being ordered by the instructor. It takes a great strength to peddle the raft; your arms get exercised, now I know how difficult the rowing sport might be, respect for those guys who win Olympics and other championship trophy in that. Trying hard we somehow used to synchronise our peddling while hitting one’s peddle on another, it felt like all we could do is to put peddle inside the water and take out, while the instructor did most of the work of directing the raft. It was fun though. The rafting is about 12 Kilometres in Kolad River and the activity starts depending on the time the gates of nearby dam are opened by government authorities around 8.30 am every day. There are 10 Rapids from grades 1 to 3 in the Kundalika River; (Rapids are sections of a river where the river bed has a relatively steep gradient, causing an increase in water velocity and turbulence. Rapids are hydrological features between a run (a smoothly flowing part of a stream) and a cascade.) Basically there is lot of turbulence and the white water can be seen, and there rafts in it go up and down, in higher grades the rafts may even collide with rocks, hence manoeuvring in Rapids is important and that’s what the adventure is. If you manoeuvre right; the rafts float on the top and may even go little in air while upward turbulence. It is exciting and thrilling to raft; Every Rapid had a different name related to its grade and turbulence. The first rapid was named Good morning and had lowest grade. The rapids in between where named like Sun Rise, Morning Headache, Rajdhani and the last one was named Johnny Walker (rest all I don’t remember, but they are funny names). Well into rapids and you hear instructions FORWARD and all put there peddles into the water and peddle the raft forward; in between duck so you duck into the raft; and stop when the rapids over. Well it was fun when he shouted everyone shouted Forward, Forward!!! Not knowing exactly if we were doing it right; but nobody cared. Synchronise Synchronize; someone used to call out like we were heading for some kind of a battle! When there was no rapid we were just going with the flow with little peddling in between. Our instructor also showed some tricks like holding to the rope and going full back and put our heads into the water; well everyone tried; and all of us wanted to remain that way for some time how wonderful it felt! Criss-Crossing and colliding with other rafts we moved forward. Close your eyes and all the worries go. Well times up buck up and you are pulled into the raft by the instructor; you can climb but there’s a technique to it and no one is in mod to follow but if interested please do. So a little ahead we take forward our raft and the shores have arrived, Climb down. Well now this is something no one is expecting you have to lift your rafts and take them on the ground. Seriously they are way heavy. When we got back to the bus it was around 1.30. Well adventure of White Water Rafting Kolad was over and now everyone was hungry. We walked for few minutes towards our bus, changed ourselves into the warm clothes with support of bushes nearby 😛 Now lunch time the organisers had made a great arrangement of lunch in a nearby hotel. It also had a changing room, so the girls could get changed. Meanwhile we boys started with lunch. It was an unlimited buffet. So we filled our plates with jalebi’s, mutter paneer, salads, papads, Dal rice and kheer, so had a stomach full lunch. When everyone was done with. Had a little introduction session, and a few photographs. The return journey started, few songs were being played, a little chit chat, selfies (a lot taken by some people :P), and one by one we felt asleep. The return journey took 2 hours and we reached Panvel at around 5.30 pm. Bidding adios Panvelkar’s got down others who had come from central and western lines went ahead. Thus a great day came to an end with smiles on our faces. The organizers also stay near Panvel so they also got down giving instructions to the driver. Kolad : A village in Raigad district situated approx. 117 km from Mumbai on Mumbai- Goa Highway NH 17. 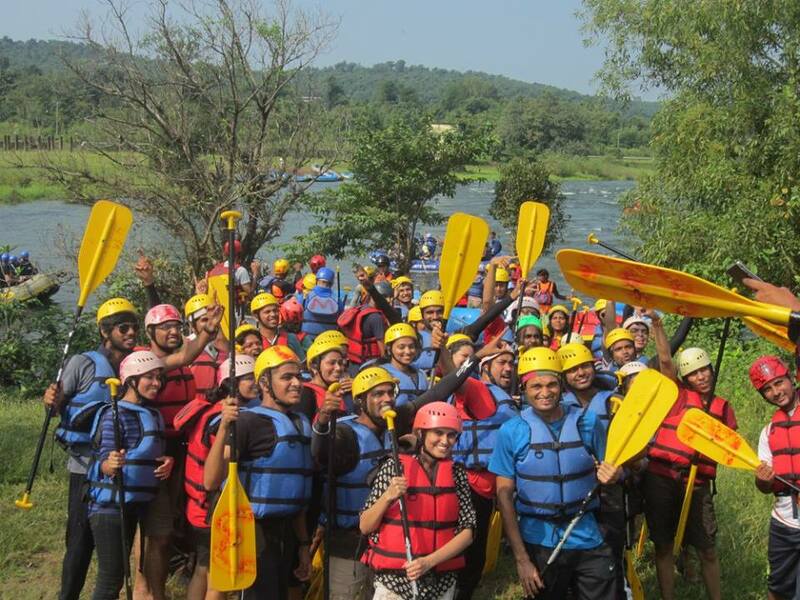 It has become a popular destination for River Rafting near Mumbai. 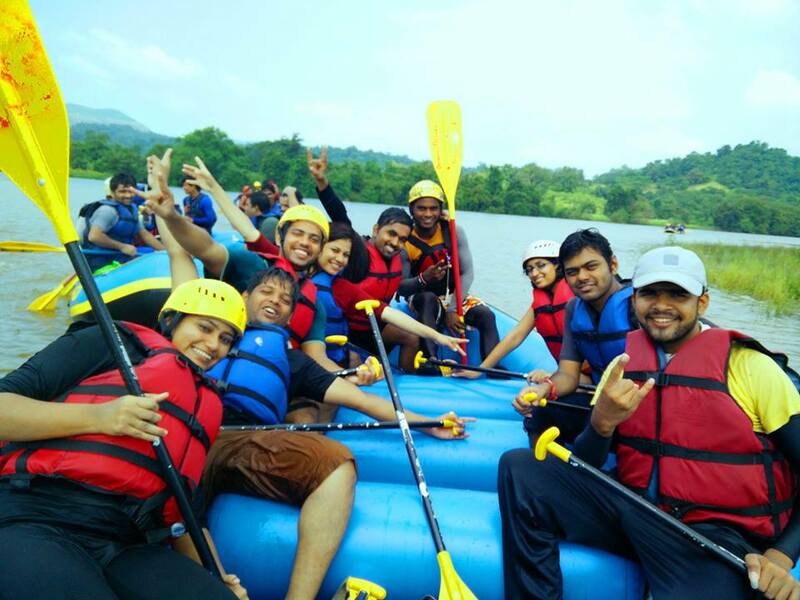 Best time for river rafting in kolad: One can visit all the season as its controlled dam water that flows through river, but make sure you do river rafting in first half. Rafting starts when the govt. authorities open the gates of dam; around 8.30 am in the morning. Other water sports activities are also carried here like Rafting, Rappelling, Jungle camping, kayaking, Para sail, Aeromodelling & all kind of outdoor activities.